Remember my post about my gallery wall inspiration ? I told you guys that I loved the house of smiths shelf with the picture frames resting on them? Well I took the idea to my hubby and he agreed to help me "build" the shelf. This is the only before picture I found of the same wall. This is from last October, right before I painted and stenciled the living room a light gray color. So the next morning here is what we had. Note that this is not the finished project, the boards are not nailed in. I just lifted the boards up and took the brackets off the wall to paint them. OK, once everything was dry, I hung up the brackets on the screws that my hubby drilled in the previous night and nailed in a nail with a nail gun through the shelf into the bracket to keep everything in place. To hang the pictures, I played around with the placement and hung them up when I was happy with the look. Most of the frames didn't have any pictures, so I just ordered some prints online. Another look at the finished project, I love it! I think it really brings the room together. I love how it turned out. My hubby was laughing because he saw the look on your hubbys face when you took his picture. He said that is the face he always make when I try to do pictures. Cracking me up. I love how it all turned out and the light colors in the room so nice! WOW!!! I've seen the House of Smith's gallery before and absolutely loved it. This is phenomenal! Good job girl! And hubby, too :) Saw your link on Funky Polkadot Giraffe - I'm linking it up to my facebook page to share. I love photography and find this wall to be awesome! Thanks for sharing! That is an amazing gallery wall! I loooove the shelf it give it definition and I really like how you used all white so it's not too busy! Great job! Great gallery wall! 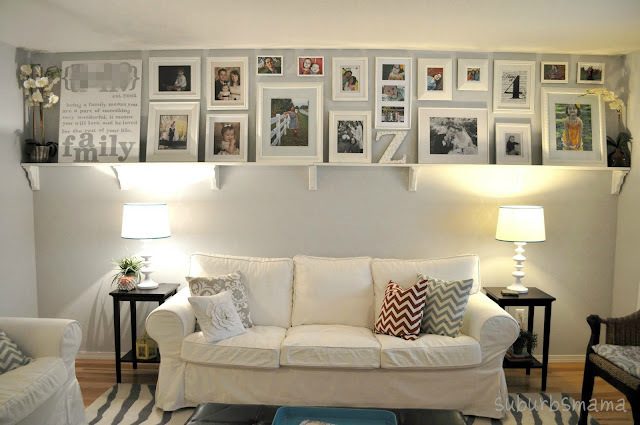 I love the used of the shelf and that large white canvas! Thanks for the inspiration! 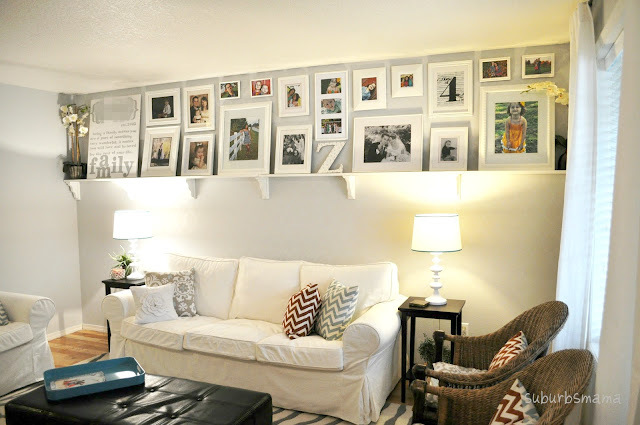 Love, Love, LOVE your gallery wall!! I am actually in the planning stages of a gallery wall for my livingroom!!! Yours looks great! This is so adorable I want to try it with our basement walls. that is great! i love the idea with the shelf, and that way you can prop other things on it. 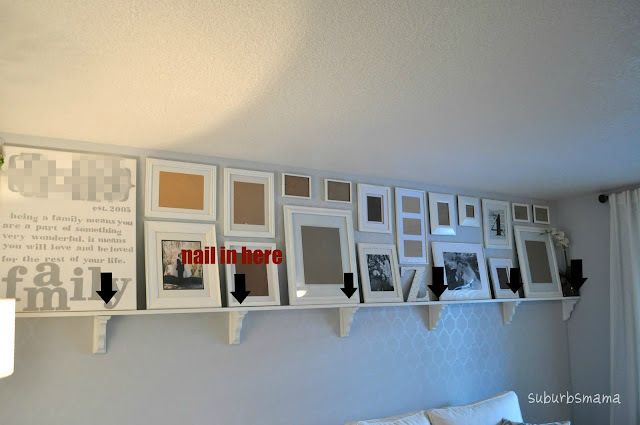 great diy that you and the hubby did! 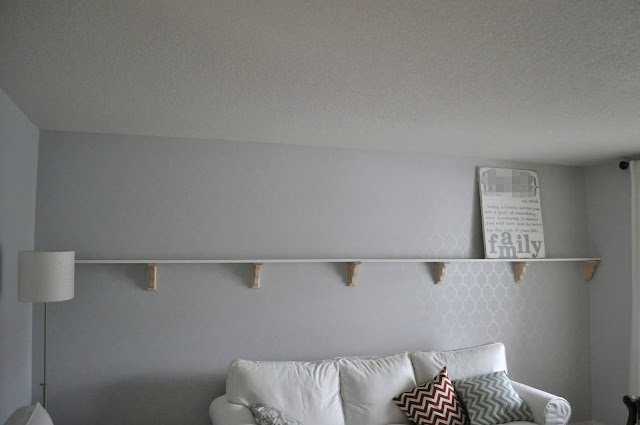 Very Cute, love the idea of using the shelf than you change things out without worrying about all those holes in the wall. That just looks fun to look at every day! Love it! It looks gorgeous!! The whole room is calm and pretty. I would love if you linked up to my Friday party! This is so well done! Your wall looks great! I made cafe shelves using the HOS shelves as my inspiration as well! So easy and cheap! LOL.."what are you thinking woman!?" Love that. That is constantly the look my husband has on his face. You know they love us when they keep on helping one project after another! Nice work! Following you from "Family Ever After"
wow! I am IN LOVE with your gallery wall! I want to do something like this in my home! I would love it if you would link this up to the Tuesday Talent Show this Tuesday at Chef in Training! I hope to see you next Tuesday! Gasp! This is AWESOME!!! wow, I'm pretty much in love and may have to do something like it in my house. Wow, what an inspiration! Beautiful gallery! I have a blank space for some gallery-esque wall hangings! Come share at my FIRST Dwell on Fridays link party! Looks great. The gallery wall really gives the room a focal point. this is amazing!!! I'm loving how your wall turned out! Great Gallery wall!!! I just featured it on the blog today!! What an amazing project! Love everything about it!